The Harem in the Topkapi Palace is as large as the rest of the Palace combined - at the height of its use, over a thousand women and children lived in the complex, but the only men allowed were the sultan and his sons. 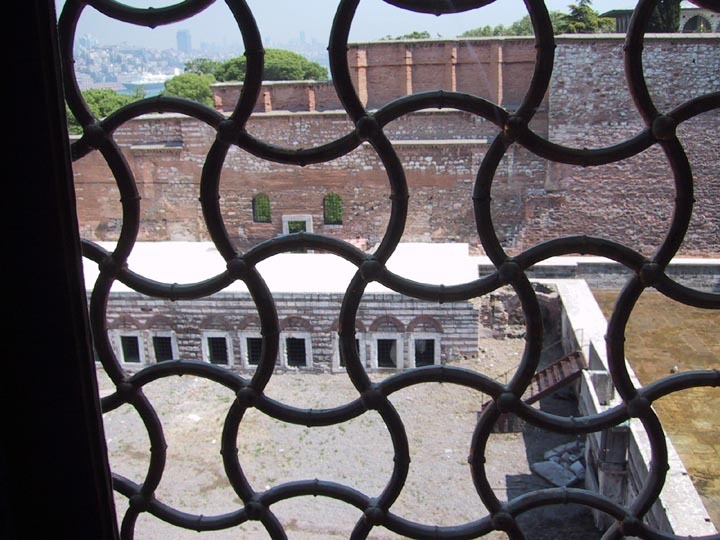 The Harem was guarded by black slave eunuchs. 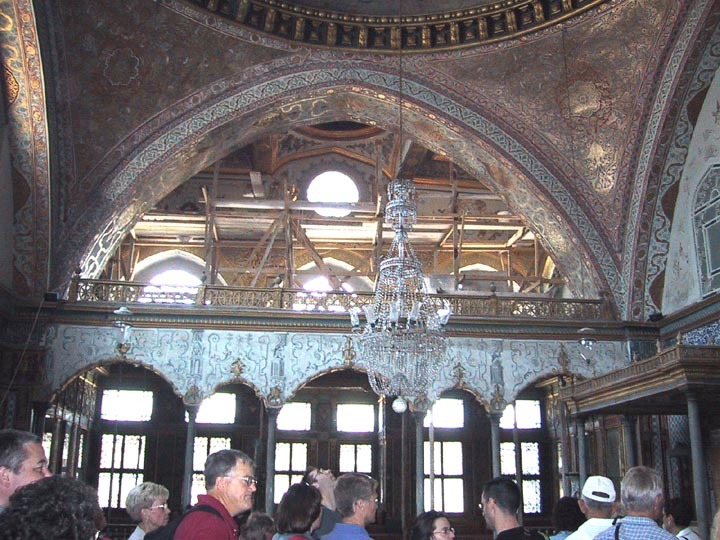 Our tour was guided - the guide made sure we didn't get ahead of her, there was another government employee trailing behind us to make sure no one got "lost" either. 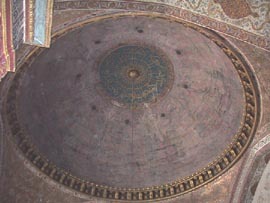 Its understandable, the Harem is very big, like a maze, really, and someone could vanish in there for a long time. 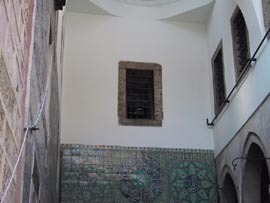 Our tour began in The Hall with Fountain, an intersection type chamber that connected the Divan Tower to the guards quarters (the Black Eunuchs) and the Harem itself. 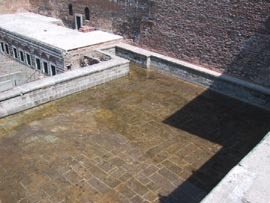 Its name come from a pool (with a fountain) in a chamber beside the room. After the Harem fire of 1666, the room was renovated using 17th century Kütahya tile. 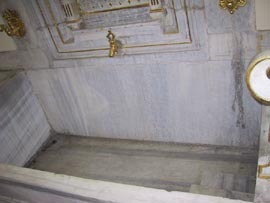 Entering the Hall with Fountain chamber. 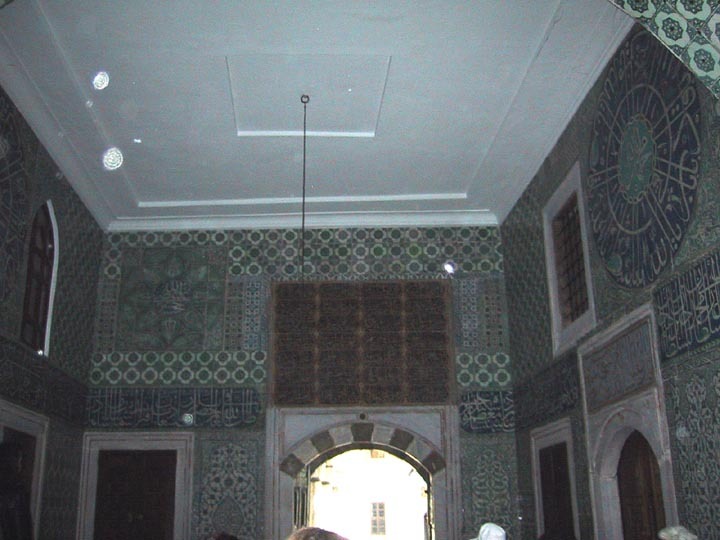 The door across the room leads to the Hall of the Black Eunuchs. 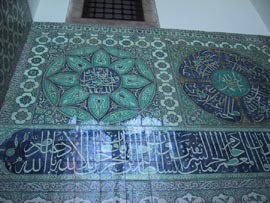 A close up look at the beautiful 17th century tile work in the room. 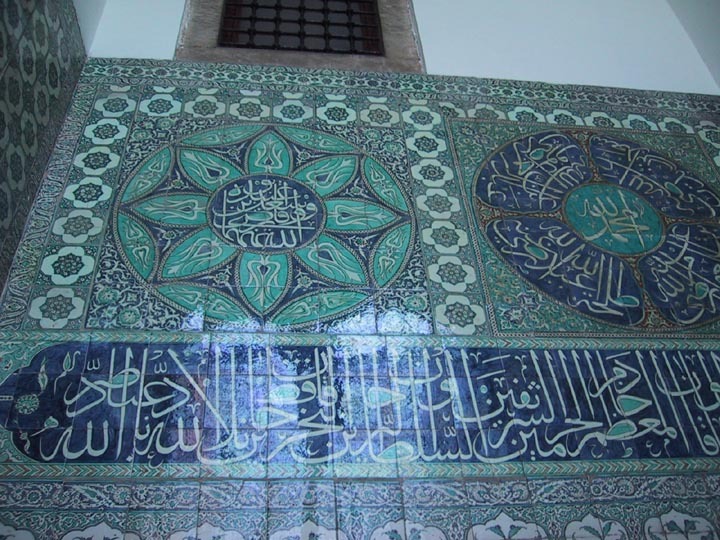 Even the Arabic script is done in tiles. 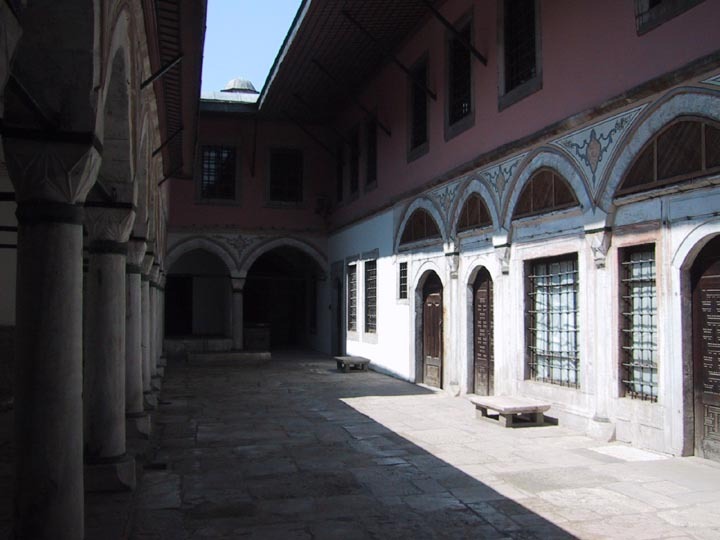 The door out of the Hall with Fountain chamber led to an open air courtyard, the Courtyard of the Black Eunuchs. The courtyard is adjacent to the barracks of the black eunuchs, who guarded the Harem. 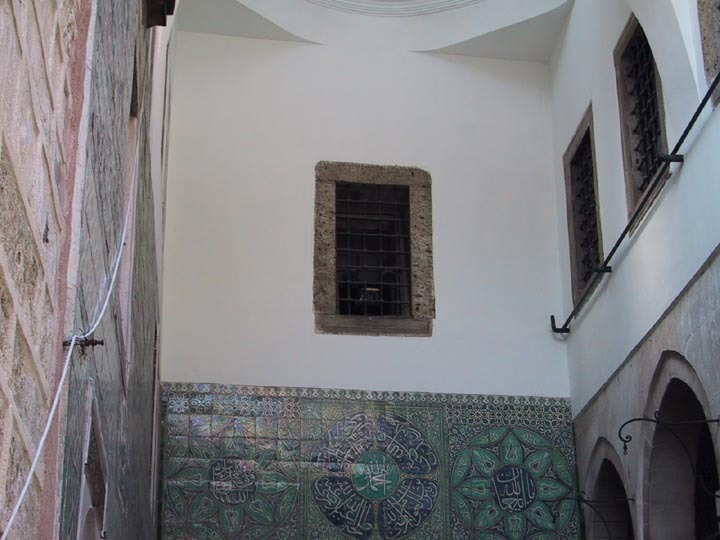 The hallway itself was just a hallway, but there was a doorway that peeked into the Courtyard of the Valide Sultan (aka - the Sultan's mother, the most powerful woman in the Harem). 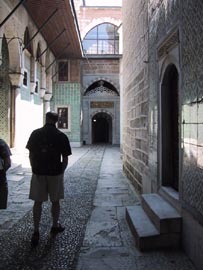 The hallway led to the Courtyard of the Concubines, adjacent to the Harem baths, where the concubines bathed. 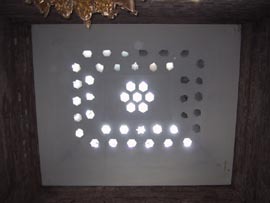 A look at the ceiling of the hallway shows the glass lenses used to gather sunlight to light the hallway. 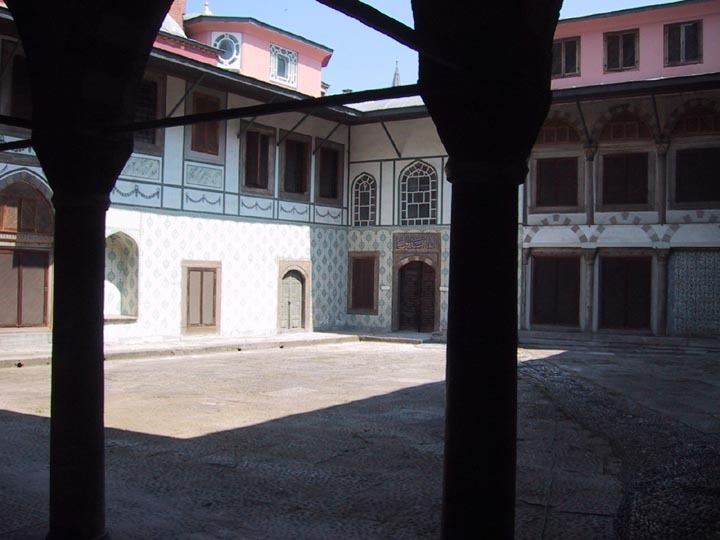 A peek into the Courtyard of the Valide Sultan. A view of the Courtyard of the Concubines, with doors into the concubine chambers. 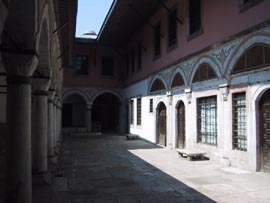 Another view of the Courtyard of the Concubines, showing the door into the baths. 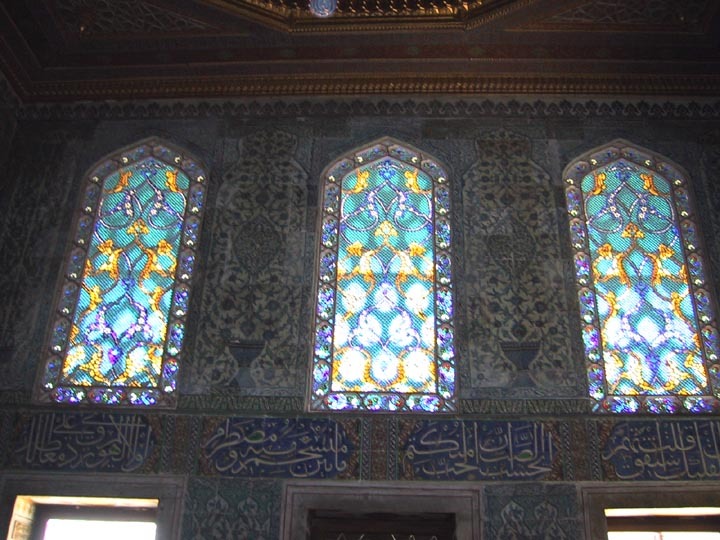 The rooms of the Valide Sultan (Queen Mother) and the Sultan combined make up the largest portion of the Harem, and are the most beautiful rooms in the place. 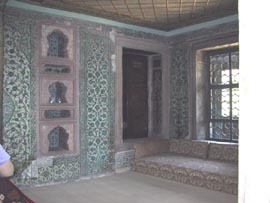 The layout of the rooms is very specific - the connection between the concubines and the Sultan's chambers passes through the Valide Sultan's rooms. In Ottoman times, the Valide Sultan had authority to regulate "relations" between the Sultan and his wives (and concubines, presumably). 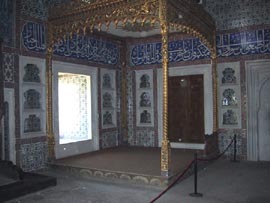 There is a hallway that connects the Valide Sultan's rooms to the Sultan's rooms. 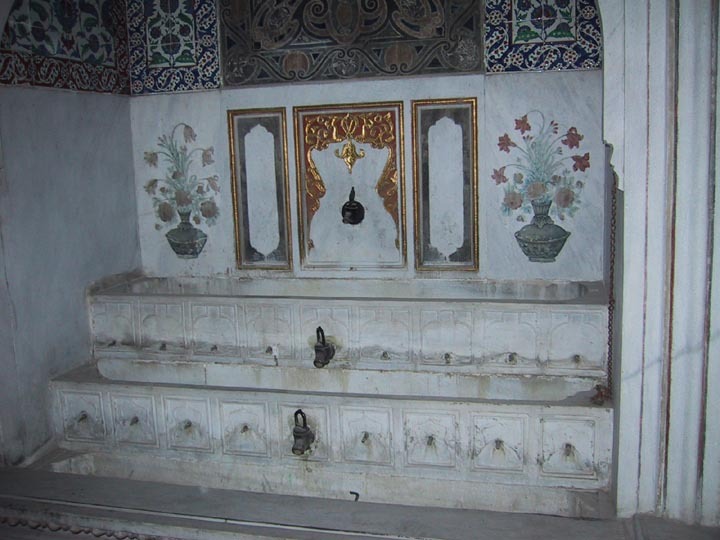 Along the hallway is a beautiful and ornate set of bathrooms (three rooms that provide what we would consider "bathroom" facilities) - apparently the Sultan and his mother shared a bathroom. 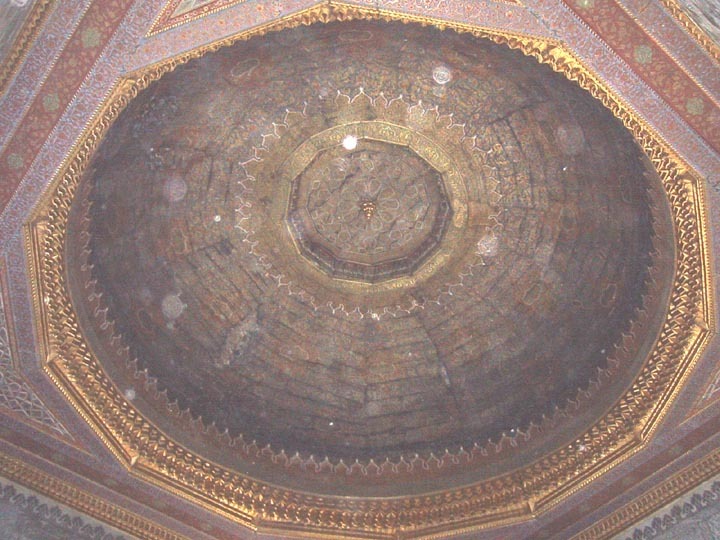 What's up with that? 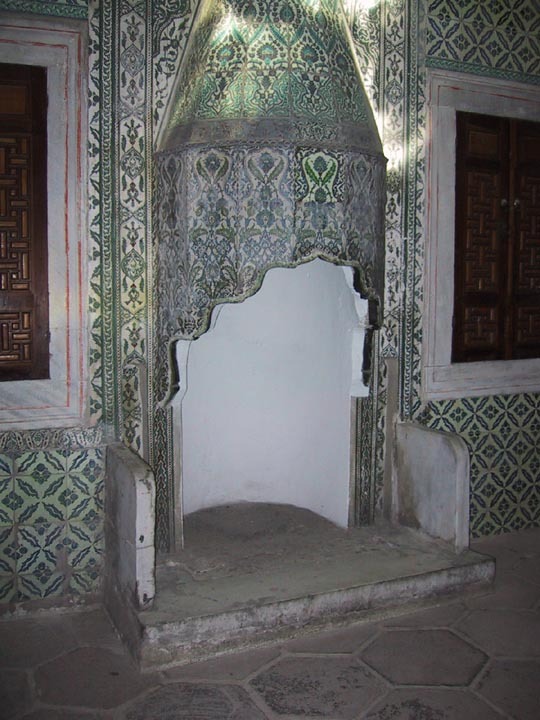 The fireplace in the Valide Sultan's antechamber. 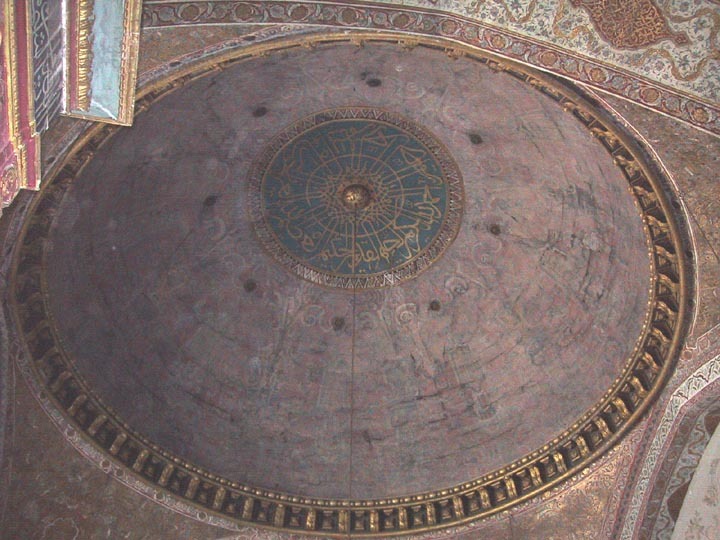 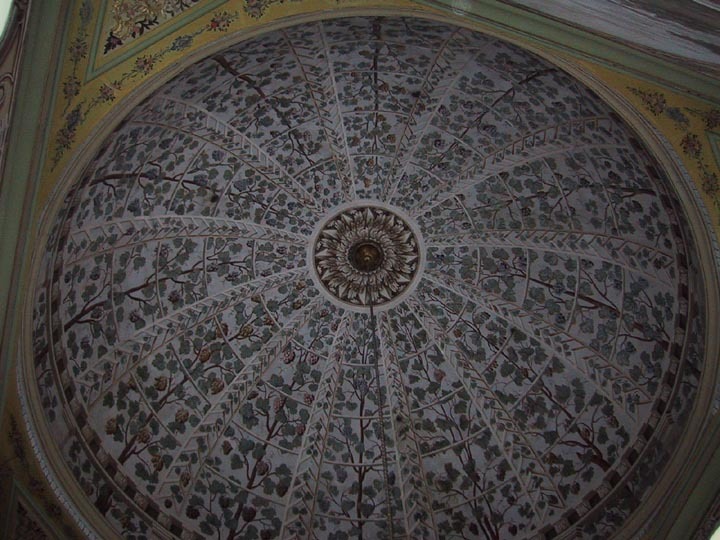 The ceiling of the Valide Sultan's antechamber. A look at the Valide Sultan's salon, the door directly ahead led to the bedchamber and prayer room. 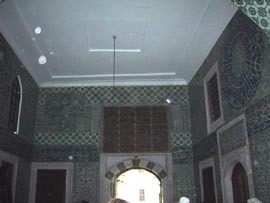 To the right is the hallway to the Sultan's chambers. 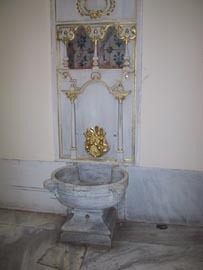 Off the hallway to the Sultan's chambers is the bathrooms shared by Sultan and Valide Sultan. 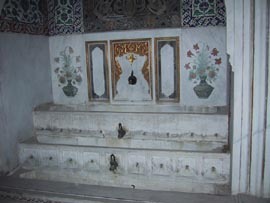 This is a fountain and basin, all made of marble. 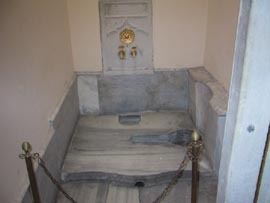 The actual "bath" part of the Sultan's bathroom, notice the small steps in the bottom right-hand corner. 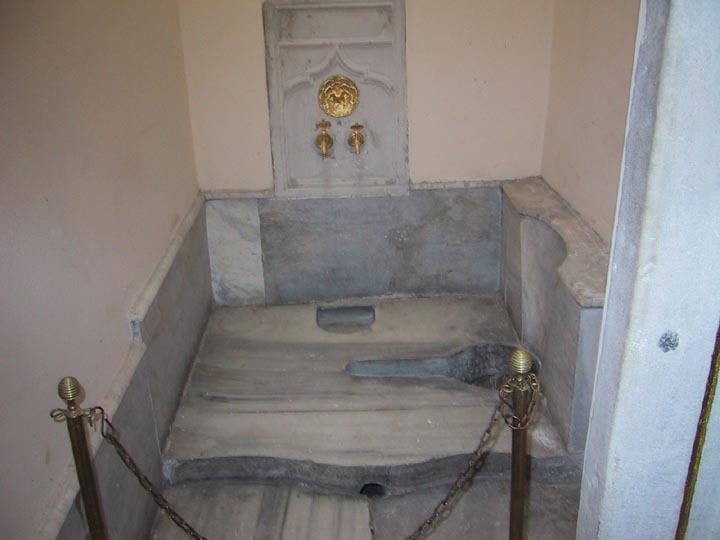 The room that everyone wants to see - the Sultan's toilet. 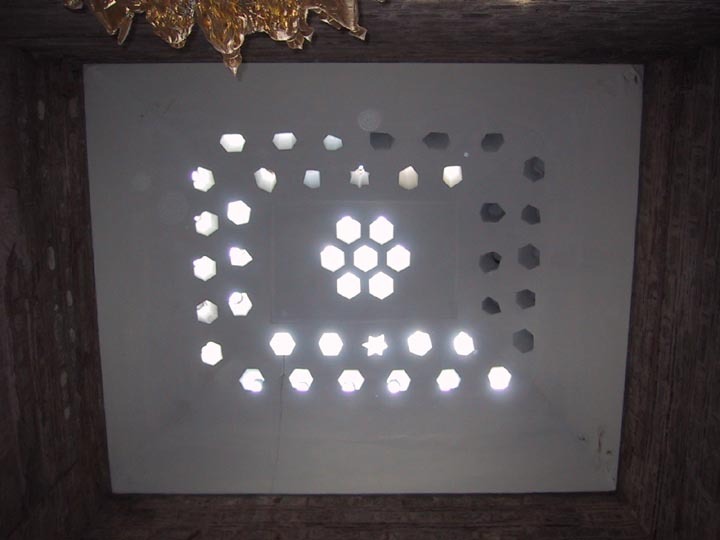 Fascinating, isn't it? 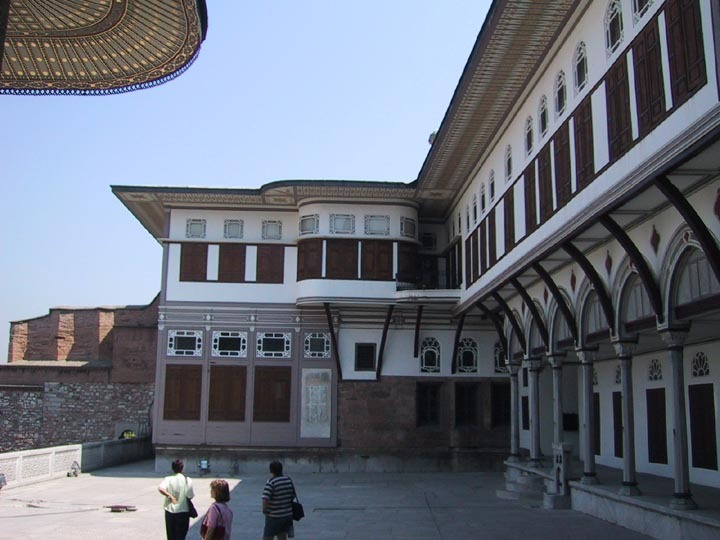 At the end of the hallway (past the bathrooms) is the Imperial Hall, used as a private reception hall for the Sultan as well as the entertainment hall for the Harem. 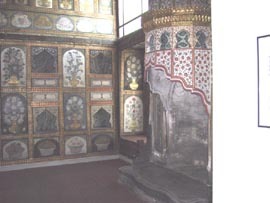 The Hall was built in the late 16th century and still has much of its original decorations, although some areas had to be rebuilt after the "Great Harem Fire of 1666." 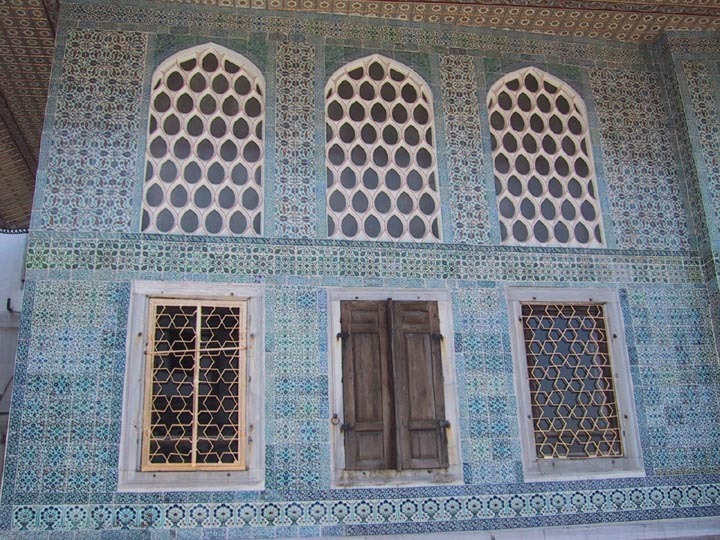 Connected to the Imperial Hall is the Sultan's Salon, and beyond that, the Sultan's Library and Dining Room. The ceiling of the Imperial Hall, the original 16th century artwork still in place. 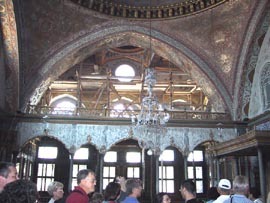 A broader view of the Imperial Hall, restoration is taking place in the back of the hall. 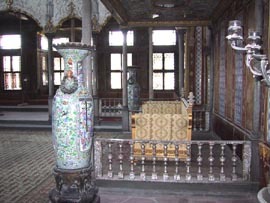 The Sultan's throne in the Imperial Hall, framed by two huge (over six foot) tall vases. In the Sultan's salon (known as the Salon of Murat III) is this fancy fountain, all marble and tiered. 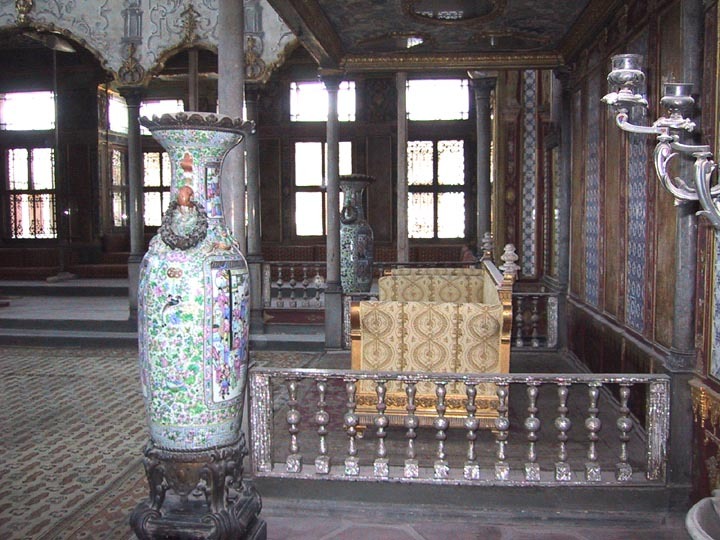 The frame of a lounge in the Salon of Murat III. 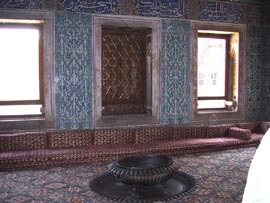 There were two such lounges in the salon. 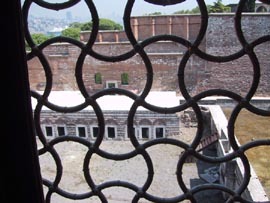 A view through the window of the Library of Ahmet I. 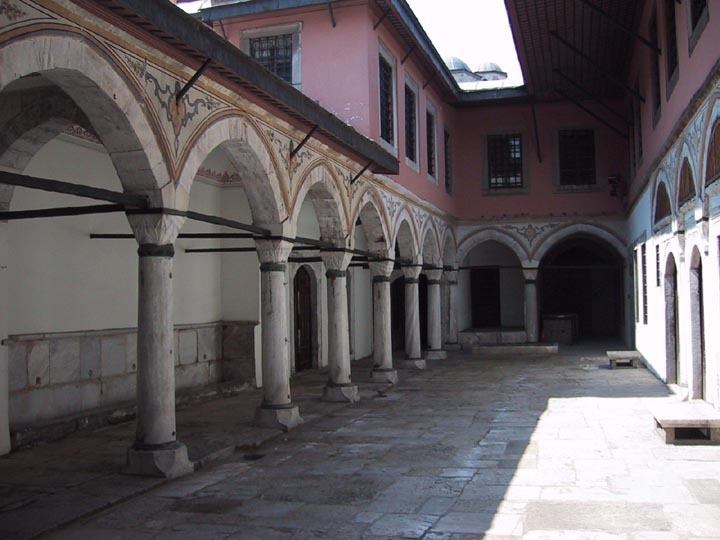 The library itself was an empty room, no books (alas). A peek into the Dining Room of Ahmet III, also known as the "Fruit Room." 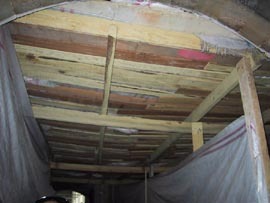 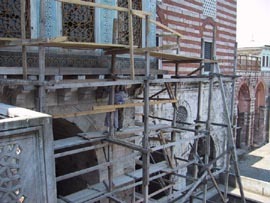 The passageway out of the salon is in heavy restoration... work continues throughout the Harem. 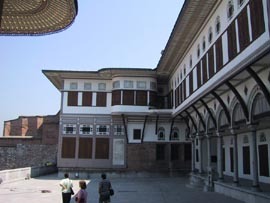 The passageway under construction leads to the Paired Pavilions, built for the crown prince of the Sultan in the 17th century. One of the apartments of the Paired Pavilion, showing the tile work, sofa and carpets. The ceiling of one of the apartments of the Paired Pavilion. The upper windows of the apartment, made of blue stained glass. 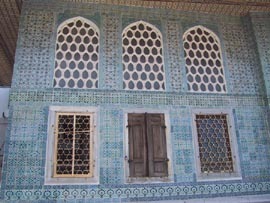 An outside view of the Paired Pavilion, showing all the windows and more beautiful tile work. 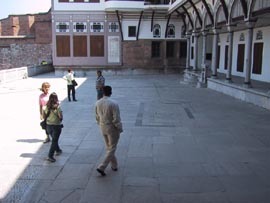 The outside shot in the previous sequence of pictures was taken from the Courtyard of the Favorites, where the most favored women of the Sultan resided. The pool off the side of the Courtyard of the Favorites, also visible from the Library of Ahmet I. 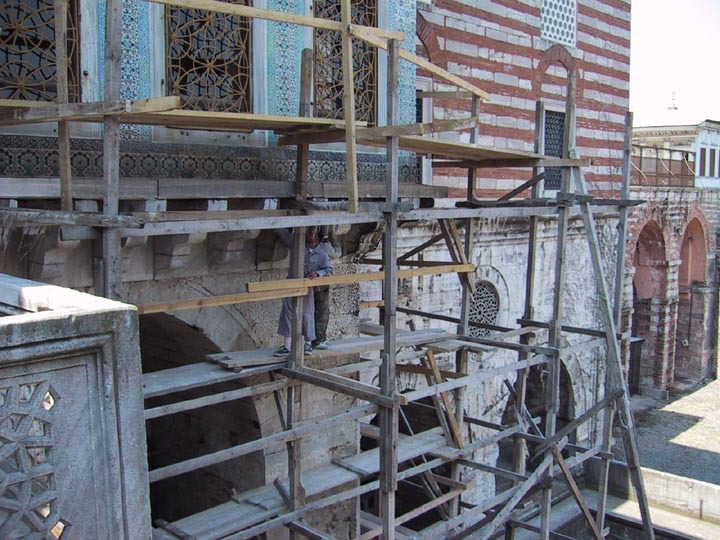 On going restoration of the abutments of the Paired Pavilion. From the Courtyard of the Favorites we walked up The Golden Way, so named because new sultans reputedly threw gold coins to their concubines... in reality it was just a hallway that led to the exit into the Third Courtyard.